Media consumption is one of the ways in which we continue to go through electronics at a rapid pace. The advancements in definition that has led to High Definition (HD) TV, Blu-ray and online content has been a boon for consumers looking for the highest quality picture, but it has left a raft of serviceable DVD players and video recorders left in the dust. These DVD players and VCRs should be disposed of ethically and with the least harm to our planet. 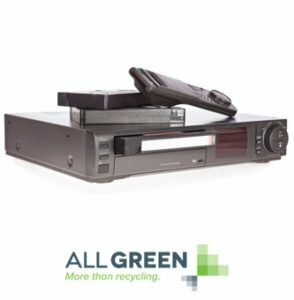 This is where All Green Electronics Recycling comes in; we are able to recycle or repurpose your DVD or VCR players in our industry-leading facilities, ensuring that they are put to best use. The traditional equipment recycling process only addresses the issue of disposal. We believe that disposal is just a part of recycling. With you, we develop an ITAD strategy that goes far beyond this. Our solutions are not only cost effective for your company, but also environmentally-friendly. Common approaches include repurposing and remarketing retired equipment. These help raise funds for the outdated assets. Recycling the rare metals embedded in DVD players and VCRs is also another plan of action. Our expertise in the field enables us to decide on the best plan as to how you decommission your equipment safely, securely and inexpensively. We can collect your DVD players and VCRs by coming to your location without incurring huge costs. How? The huge fleet of electronic recycling trucks we manage for our tasks. In fact, our fleet is the biggest in the continent. All tasks of dismantling, labeling and packaging of your retired equipment will be taken care of by our recycling experts, who can be scheduled to come any time at your convenience. Using our sophisticated online management portal, you can even track your equipment’s location in real time. Recycling equipment responsibly has not always been such an easy task. One who assumes the task of decommissioning equipment with potentially valuable data bears a huge responsibility. Even DVD players and VCRs need to be handled with care. That must be carried out with the greatest care. Our long history of integrity has rewarded us with the trust of major businesses and government departments. Each step in our operation of every single asset is monitored with the utmost care. Unsafe disposal of DVD and VCR equipment is punishable by law all over the country. Such laws on equipment recycling are meant to impose huge fines. Their amounts can be significant enough to have your business crippled or even licenses revoked. Our own guidelines are significantly stricter than the government minimum, and 100% of items that navigate across our lines are recycled. Because of this, your company is both risk-free and a contributing partner in the sustainable future of our environment. Many people think of things like plastic bottles, paper, aluminum, and other more general materials to be the main target of recycling. They are also the easiest thing to think of when it’s that time of the week to get rid of excesses around the house, and with bottle banks all over its easy to feel one is doing one’s part and that’s that. But it’s time to think about other things that can and should be recycled. One of these things is old media devices such as DVD players and VCRs. Of course, if these items still work, it is probably better and more beneficial to try to resell them or donate them. (Note: All Green Electronics Recycling can help in this endeavor). However, if they no long work or can no longer be salvaged, then recycling them is the next best thing. It is really important that things like electronics are taken care of in a more responsible way when it comes time to get rid of them. Why? DVD players and VCRs contain harmful chemicals that can be leaked into the environment when they are thrown into landfills. Some people are unaware of this. Many people also have no idea you can recycle DVD players and VCRs easily. 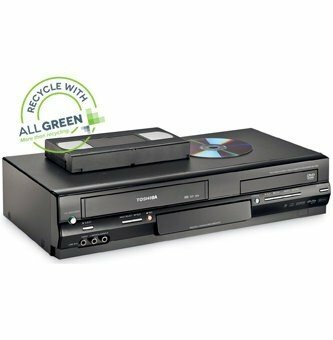 All Green DVD player Recycling nationwide drop-off locations mean that there is very likely a location near to you where you are able to drop off such electronics like DVD players and VCRs to be recycled. If this is not convenient for you, we’re available to come out to your location to pick up your obsolete media player for you, handing all of the packaging and labeling! It simply could not be easier to recycling responsibly. Recycling electronics will not only help to free space from landfills, but it will also be a great thing for the environment. Be sure to start checking all of your storage now and see what you can start recycling today. Get in contact with All Green Electronics Recycling, and we’ll be able to help advise you. In this day and age of mass electronics consumption, there are more and more possible materials that can be dumped in a landfill. It doesn’t have to be that way. Recycle all your electronics like DVD players and VCRs and start making a difference for your environment, all the while clearing out that garage or spare bedroom and benefiting others from the parts or materials reclaimed from the old electronics.